Torrential rainfall and snowmelt are quite common in our country. Torrential rainfall and snowmelt are quite common in our country. Moreover, they do not consider the fact whether or not you're located in a low risk flood zone or a high risk one before hitting and damaging your homes. For example, people residing near the North Dakota's Souris River never thought they will be affected by floods as dikes were put in. But last year, this region was hit by severe floods making thousands of people homeless. As people did not have flood insurance and as it was not even covered in their homeowner's insurance policy, they faced severe financial crisis due to the floods. 1. Assess the flood risk of your property: Floods are considered to be the major natural disaster hitting the country every year as per FEMA's research. So, whether you live in a high risk zone or a low risk zone, you always have the risk of facing floods. Most of the floods take place in the Non-Special Flood Hazard Area (NSFHA) and people residing in this area file the most number of insurance claims. So, if you reside in such an area, flood insurance is very important for you. 2. Take into consideration worst-case scenario: It should be noted that homeowner's insurance policy does not offer you any type of flood insurance coverage. You should remember that if you don't have National Flood Insurance Program (NFIP) policy, you will be liable for the payment of your property repair or rebuilding your home and replace damaged things. Also, you should note that if the flood is declared a federal disaster, you won't receive much help from Uncle Sam. You can apply for a direct grant but it will be capped at $33,000. In this worst situation, you can apply for a low interest loan and repair your property provided you're eligible for it. 3. Check out your eligibility for flood insurance: In order to get a flood insurance policy, you don't have to reside in a high flood risk zone. But again, you should live in a community which participates in the National Flood Insurance Program (NFIP) in order to qualify for this option. Most of the communities participate in NFIP. If your community participates in this program, then as per FEMA rules, local governments should take steps like shoring up levies, etc in order to avoid floods. To know whether or not your community participates in this program, you need to check out NFIP's online Community Status Book. 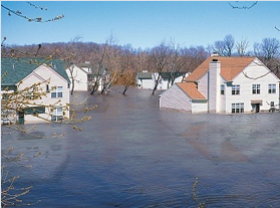 4: Check out flood insurance limitations: Yes, there are limitations for flood insurance. You should note that Federal flood insurance is available for an amount of $250,000 for building damage. Apart from that, $100,000 is available for other household contents. But you should note that insurance coverage is limited for basements. 5. Consider premium costs: It is very important to consider premium cost. You should note that if you live in a moderate or low-risk area, there are high chances that you will qualify for Preferred Risk Policy. This will help you get building and contents coverage for $129 to $405 per year. On the other hand, a renter's flood insurance policy for contents normally starts at $49 a year. Apart from this, if you're in a SFHA, then your rates will vary from $472 to $2,930 for building and contents. You will get $376 to $1,805 for building only and $136 to $1,165 for contents only.